The Dillards are back in the United States taking care of a few important tasks that will allow them to be more effective once they return to the mission field in Central America. Jill passed her midwifery test and is now a certified professional midwife, a designation administered by the North American Registry of Midwives. CPMs are required to meet rigorous requirements, including lengthy written exams and extensive hands-on skill evaluations. On Sunday, the Dillards made the two-hour trek from Northwest Arkansas to Silver Dollar City, a family-friendly attraction in Branson, Missouri, that is beloved by the Duggar family. Why in the world would someone need collage to be a missionary? I know their mainly in el sal. To learn Spanish to be better equipped missionaries. I do agree that they probably should have finished up things in the US before moving to el sal. And with Derek's new braces I'm sure he'll be needing to come back often for that. They have been too vague about their mission work though. But seriously they don't even have collage courses for mission work. You get training from the organization you go into missions with. My family has been in ministry a long time and u have never heard of college courses being required to be missionaries. This assumption on your part may be due to your own religious background. I also know that it's normal to ask for donations from your church but also person friends and family. We have done this as we planted a new church in the states. We kept people informed with updates in the form of email. No one ever questioned our personal choices. If we needed to travel it even have some fun. When you donate you don't own them. I think it's also best to give them the benefit of.the doubt. They may have savings, a other source of personal income. Or parents may be helping the newlyweds travel. I know our parents did in the beginning of our marriage. If you personally are donating and.have questions you should be able to contact them and.ask your questions. If not you are seeming like you are being nosey and stirring up things you have no business in. And talking about it here is gossip. Isn't that what Derreck go to college for..isn't that what he was doing i n DuPall or where ever it was she went and met him? There has been a lot of news about Jill/Derick and Jessa/Ben. What are the rest of the kids doing? What is Joy up to? What is Joe majoring in during college? Jill looks pregnant; is she???? They come back to the states frequently; pre natal visits?, why else???? She just had a baby six months ago. I highly doubt she's pregnant again, and if she were, it wouldn't be noticeable yet. Unlikely if breastfeeding her baby. So glad to see happy news for you guys.God is good.Take care of yourselves and the extended family as well.Can't wait to see what else the good Lord has in store for you ! Congratulation!! So happy for you Jill. Miss watching your family...,praying for you all! Congratulations Jill, wonderful news. I think of y'all often. Anxious to see you back on TV. Israel is so adorable. Congrats on your accomplishment and your beautiful family. As an RRT, wouldn't an RN in addition to you midwife training be more helpful in the mission field? Good luck and God bless. If Jill and Derick are doing tv shows and getting paid for it, why are they asking for financial support? It seems it would be more fitting for them to be asking for prayer support and paying for this missionary venture out of their own pockets. Others want to help. They are giving them that opportunity. I really miss you and pray that one day we will see you back on TV. Your shows were such an inspiration to families raising children, so uplifting! Wish there were a way to keep up with your family.......it's almost like having a part of your family move away never to be heard of again! Not working? And moving to another country is not always as quick of a process as some may assume. It often takes a few trips to prepare a place, tie up loose ends, etc. It was likely planned ahead, or necessary. Sometimes, foreign illness or homesickness requires an extra trip. What may seem to most that they haven't been in Central America very long, to a homesick foreigner can feel like an eternity. 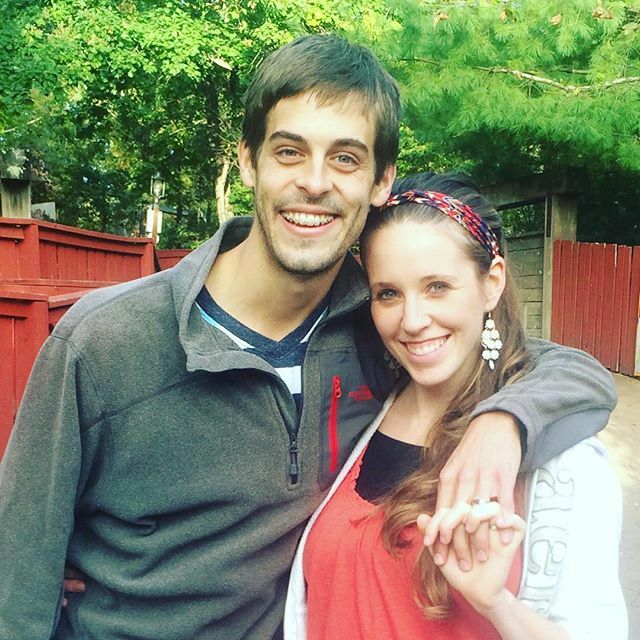 It looks like Derick has braces. Fantastic smile. I don't even care that they go back and forth between countries while they are establishing their missionary status. I love these kids! Their heart is in the right place. I'm surprised at how often the Duggars travel on Sunday and don't seem to be attending church. Also, how many times a year to they frequent amusement parks? We have a much smaller family and cant afford to go to amusement parks even once a year. Michelle looks like she is in her element. A happy grandma, indeed. I can't wait for their return to television. I love being able to share their lives. Congratulations on your CPM. You've worked long and hard. So good to see pics of you both. Wishing you all the best. 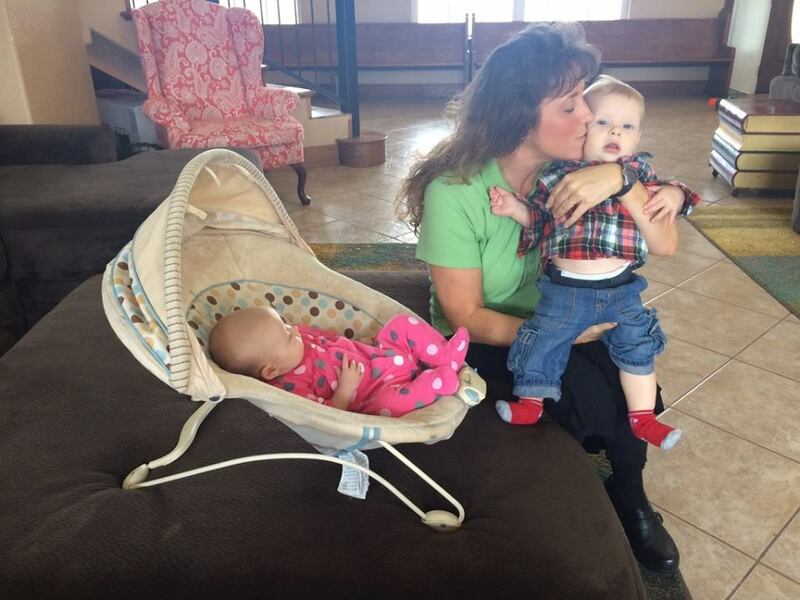 Precious pictures of Michelle and her grandbabies. Great picture of Jill and Derick. Thanks for sharing, nice to see a picture of Michelle and her grandchildren. Congratulations Jill! You and Derick look so happy in this pic. I know how good it is to visit family and friends when you can. I got a peek of baby Israel with his grandma Michelle. I love the updates. Love the Duggars! God Bless! I miss 19 kids and counting . Congrats to Jill for midwife, and Jessa and Ben on becoming parents. May God Bless you all. Pray I pass my Pharmacy tech Certification exam. My phone said you are not receiving my post. So I hope this works. I send prayers for you all. Jill and Derick you have an adorable son he is so cute what a smile. Speaking of smiles you too look happy as cam be. God Bless You and Your Families. Could not have said it better. Thank you for saying it so well. We really are so proud of you Jill. God Bless. Wow, the orthodontia has really widened Derick's upper palate. CONGRATS ON YOUR BECOMING A MIDWIFE!!!! WHAT A WONDERFUL CAREER...I WISH I WAS WITHIN CHILDBEARING AGES TO HAVE YOU DELIVER MY BABES....YOU AND YOUR LIL FAMILY ARE SO BLESSED AND GOD LOVE YOU AND KEEP YOU SAFE. GOD BLESS ALL THE DUGGARS AND NEW MEMBERS..
You all are an incredible family. God Bless you and your family! Hi, great blog! Can you please tell me how I can post something to the duggars? Thank you! Love and prayers for your beautiful family! Congrats Jill! I really don't see the point to give the donations to complete their education. They didnt do anything yet for the people in south america. I must have missed something. Who does Meredith belong to? Anna and Josh? Merideth is not buckled and the bouncer is on an elevated and soft surface. This is dangerous!!!! One little kick or roll could cause a serious accident. This family should know better!!!! The infant seat is well back from the edge and Michelle is literally right next to her. No kidding! (About the bouncer) That is so dangerous. Could we have an update of Anna Duggar? I have been praying for her but would like to see how she is doing. I guess I missed Ben and Jessas birth what did she have please put 19 kids and counting back on the air miss them so much there just like family been watching them grow up like my own family have a heart keep me posted please . Jessa hasn't had her baby yet. She is due November 1st. I wish you were back on TV. Dis I miss an announcement for the meet and greet?? Funny how many people comment on how can they afford to do 'travel, amusement parks, ect...' I am sure they are using personal funds for anything not related to missionary work, they are frugal people and I bet Jim Bob and Michelle set aside money for each kid from the show proceeds, I personally have been praying to be less judgmental of others and have been practicing looking for reasons instead of assigning blame, give them a break and CONGRATS JILL! Also for the people saying they travel often on Sundays, maybe they have church on Saturdays???? I miss the show so very much. I belong to a mainstream denominational church. Our missionaries attend seminaries and earn ministry degrees. They are then called to the places where they do mission work, and are paid by the greater church, much the same as pastors are paid to serve congregations. I don't understand the concept of having to pay to be a missionary. Isn't a church or denomination paying them. To whom does this donation money go. I am really not being critical. I just don't understand. I really think it's just a denominational difference. So it's just foreign to you because of your background. What they are doing is not odd at all from other backgrounds. Thanks for the replies. I can appreciate that churches have different policies on entering the mission field. What is really important here is that the Lord's work gets done in areas of greatest need. Thank you for the explanations. Hey Lily and Ellie, Did you know there is a petition to stop the special featuring the girls? Its called TLC Stop the Duggars from getting a new reality show by signing this petition. Its with Change.org and has 269 signatures. Do we need to start our own petition? Congratulations!!! Praying for y'all, my prayer for your 👪 as Ialso pray for my own life. Is that y'all continue to stay in the center of God's Will. Always keep satan under your feet. Stay blessed and be safe!! Wondering if Jill is going to deliver Jessa's baby? Was wondering w Jessa is doing. When is she due? Has she given birth yet? I am with Jill and Derek........coming back to the USA so often doesn't sound "good". If Jill and Derek want to have a TV show and need to be back for that, then give up the missionary work. I know where there heart is, but maybe that will happen in the future. Too soon with a young baby. Take care of family here and maybe do your TV show and make money and then have support and college education (which is needed for missionary work) and then move forward. I love you Jill and Jessa and your family, but you must understand you are under the microscope and people will judge what you do or don't do. Praying for your whole family. Love ya all. I get so tired of people that have nothing but negative things to say about this family. Are they perfect....NO, but this family does a lot of good around the world and they DO donate their time, skills and give financial support to many!! They all live very frugally. Maybe the reason they can afford to go to an amusement park is b/c they don't waste money on frivolous items and buy most of their needs from second hand stores!! TLC missed the mark on taking their show off the air. They could of used this as a learning opportunity about God's grace and forgiveness when we sin.....which is something that every person (including all the people that leave negative comments) do every single day!!! I love the Duggar's and look forward to the specials that Jessa, Jill and their families will be making. I really miss the entire family! You are so right. I agree with everything you said. I pray that we will get to see the entire family back on TV very soon. God bless them. 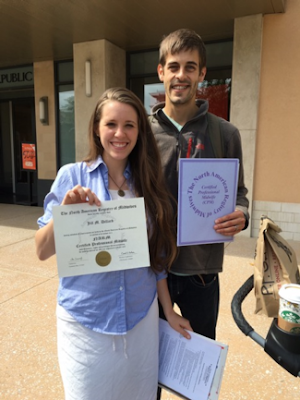 We are so proud of you Jill, we know how much it means to you to get that certification. Look forward to seeing you on TV soon. Remember, this family does not spend money on alcohol, new clothing, movies, college tuition, sporting participation, dance lessons; etc....so, therefore they could easily have cash for amusement parks! Congratulations Jill on passing your exam. I'm so proud of you. Doesn't seem like your son is six mo. old already. God be you and your family. @AnonymousI want to know how they can afford all these trips back and forth, that is a lot of money. I wonder the same thing. Congratulations Jill! May God bless your family !I'm so glad you are back on tv......wish to see the duggar family members. To my understanding having been in church for the last 45 yrs not every missionary or missionary to be, is sponsored by their own church. Some are and some are no !. Some ARE just sponsored by individuals with in the church, workplace or organization and others they know or have come in contact with - as is the case with Jill & Derick, And it is quite normal to build a sponsor base of support people. It should be made VERY clear even if a missionary couple is prayed for by the church before they go it doesn't always mean that the church, even their own church is sponsoring them or is being sent by that particular church or organization. Usually a good understanding of the word of God is required for being a missionary. Language courses related to the country that the missionary is going to are usually required but this is more often than not done after arriving in the new country. Being in Good health is another requirement - though an informal one. Other requirements are specific to specific churches and not a formal requirement of church missionaries over all. In addition to this other skills such as being a Midwife or teacher or say a pilot are what an individual brings to the mission of his or her own accord. Though a church may require specific skills to be taught for a specific mission before a person leaves for the mission it doesn't mean that all missionaries to be are required to do the exact same thing. As for Derick & Jill they bring with them - a Good knowledge of the word, Dericks prior experience in the mission field, his accounting skills & Jill's Lay midwifery skills. In addition to this they are currently learning the Language of the country they are missionaries to - and I know that takes some time to perfect. As we all know Derrick and Jill did not plan to become missionaries so soon but stepped forward in faith ahead of time. I would not expect Cross church to be sponsoring them as they have only been attending for a short while as far as I know or sending them out as one of their own missionaries even though they apparently very kindly prayed for them in this regard, as some times churches do. I know plenty of people who are missionaries that started out just as Derick & Jill did with no Church Sponsorship and only with the support of individuals. In time this can convert to Church Sponsorship. The media has portrayed them as fraud which is un truthful - a twisting of the truth in order to get the publics attention - to deliberately make waves in order to make their own profit out of the unsuspecting public and to pull down the good work of others. I get the feeling that the media beginning to tread on very thin ice and soon will be caught out in its attempt to make spin a story on this I have caught the media out telling untruths about this family many time. Please research your facts PROPERLY before you even attempt to believe anything that the media says. Please be very careful what you read in the media about people such as these. I hope this clears up some issue for the readers. Thank you! My thoughts exactly!! Any updates on the rest of the family? Do they take any theology courses? I know Jill and Derek are compassionate and carry Christ into the mission field. But there has been a history of oppression in the name of religion. Every missionary needs to be held accountable and kept Christ-centered. Not every self-appointed minister is really equipped to work in the mission field. Serious damage can be done to people and cultures by people who are unqualified. "The road to hell is paved with good intentions"
I miss your guys show so very much. so wish it could be put back on the air. it was one show i looked forward to every week. i do so enjoy all the updates though. I'm sorry... but I think it would be nice to have an explanation to where is going the money the dillard couple is requesting from the viewers/readers/fans... there have been released some disturbing news about this issue, that claim they are not in fact missioners because they are not enough qualified for that, and that they are using these donations for themselfs... it would be important to get a clarification as soon as possible for this .... thank you! Thanks for the new photos. I can't believe Israel is 6 months old already! And adorable! So is Meredith! And congratulations to Jill on her CPM !! Very proud of you Jill. :) How great it is to be the one to bring a new little life into the world ! Love you all and praying for you everyday. God Bless you. I wish people would quit picking on the Dugger family, all families have some dirt if you want to look for it. Not all churches and/or denominations sponsor missionaries at 100%. Many, while providing some support, require their missionaries to raise support from other sources. @anonymous54 Merideth is 2 MONTHS OLD!! She is not going to roll over! Michelle is right by her. I'm sure that nobody left her unattended. Who cares what they use the money for! It drives me nuts when people complain about what they are doing with the money. If you have an issue with how they spend their money don't donate! They are VERY frugal. For all we know they could still be living off or wedding money. As for flying they could be in frequent flyer programs. You can give your points to family or friends. I really like Jill and Derek, but I,too, am confused how they travel back and forth so much and still ask for donations! Please don't give any more reasons for unbelievers to accuse your family. Some missionaries are not connected to a particular denomination. They need to raise their own support money. Every other year my husband and I take a BIG trip overseas. We manage it on our small income 45000 between the two of us, by putting aside a little money every month, traveled off season, staying in family run lodges,hotels, and during the year we live very simply. I thrift shop clothes and home items, I check out books and movies from the library, we potluck it at home a lot, or at friends homes, I no longer color my hair...what else? What I'm saying is, there are ways to do it, but it requires learning to do without somethings, or better yet embracing a different kind of things. My sister always says "I don't know how you guys can afford to travel". But she just not paying attention! Amazing how many people really want to be super critical, I had a thought that some of the money for mission work could be going to medical equipment for Jill to use to be a midwife there and provide care to people in need. There are so many positive things they could be doing or have in the works! Oh,how the masses still are so quick to judge and speculate , i for one am so tired of it.Maybe people should be more concerned about their own life and less worries about someone who is not harming said posters. To the person who earns $45k a year for two people and manages to take a "BIG" trip overseas every single year --- you must be living in an area where the cost of housing and living is absolutely rock bottom. So proud of Jill congradulations my dear God bless y'all keep up the great work for the kingdom!love the baby so cute! Have a awesome day! Missionaries need money for all the things necessary to life for example: rent, electric, phone bills, gas, vehicle insurance, health insurance, food, and supplies (diapers, wipes, soap, shampoo, toliet paper...) for their personal family. They have to pay to go to language school to learn the language of the country where they will be serving. They also need funds to get their visas and funds to ship their clothes and furniture to another country. Then if they start a church, they need funds to pay for the building (or rental for the building), electric, insurance, chair rental (or money to purchase chairs), nursery equipment, Sunday school supplies (coloring sheets, crayons, pictures to use to tell stories...), song books, etc. Missionaries are generally tender-hearted. They end up spending money that they should be using on their own families to help the families where they minister. Missionaries make a great sacrifice to leave America and go to countries where they will have a much harder life than if they stayed here. They don't have all the conveniences that we have and leave family and friends to most of the time live a poor, simplistic life of service to others. Straps come with the thing for a reason. It's not even on the floor. Grandmas hand a full should she drop one kid to catch the other? She could easy slide off the thing then onto the floor. And it's hard tile. And she is sitting on a basically the cushion supporting the thing making it lean forward. It's not solid. Anyone can make such a risky oversight. But to notice the mistake before posting the picture would be wise. @AnonymousSame here what is the truth are they really missionaries? Why asking for all the donation, and do they hold the credentials yes or no? Have the Dillards returned to Central America yet? He has an accounting degree from Oklahoma State University.